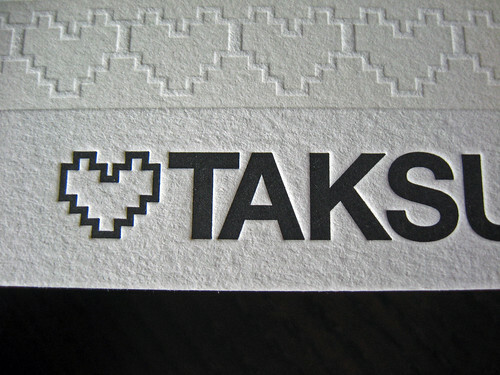 8-bit inspired letterpress hearts melt ours! 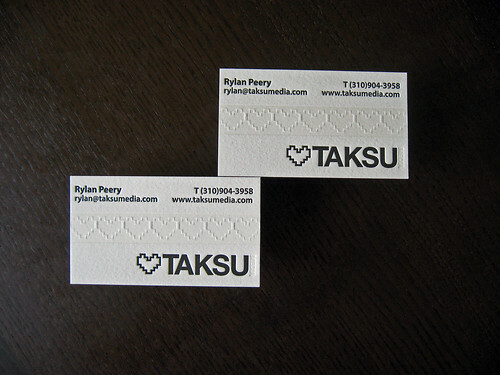 Rylan Perry and the whole team at Taksu Media are really creative and it shows in these business cards. 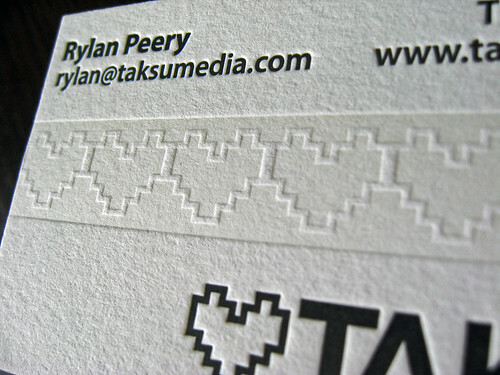 We first heard from Rylan back in 2009 when he inquired about printing for himself and a client. The best way to get a quote is to send your inquiry to contact@dolcepress.com with as much information as possible (quantity, size, # of colors, paper, finishing, …). 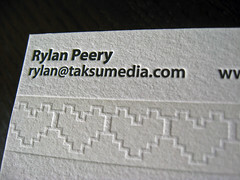 Check out more photos of Rylan’s letterpress cards after the break. The cards are a simple 2-color letterpress job printed on 110lb fluorescent white letta. 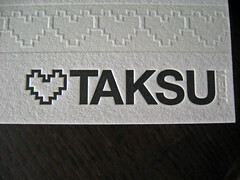 The black color was printed first and to ensure a nice solid coverage on the TAKSU logo we skip fed them. Skip feeding allows the plate to be inked four times for each impression on the press. 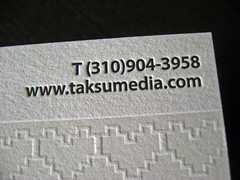 The second color, a transparent white ink, was printed next for MEDIA and the heart banner. This photo (above) is of transparent white, a honey like ink used to mix colors or add shading to a design. 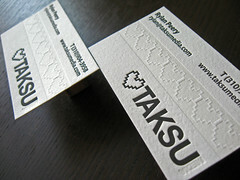 Check out other cards we recently printed with transparent white ink. 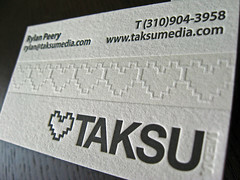 The heart banner was printed as a knockout, a really neat trick that we love to use! 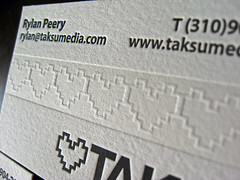 The knockout creates a faux emboss since the heart vector remains puffed up while the solid around it is pressed in. We think the finished cards look and feel pretty cool. Got a question? Ask us in the comments below!